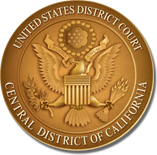 On Thursday, November 27, 2014, the United States District Court, Central District of California, will be closed in recognition of the Thanksgiving Day Holiday. On Friday, November 28, 2014, the Court will not be open, except for criminal duty in Los Angeles. Normal service will resume on Monday, December 1, 2014. Have a pleasant and safe holiday.